They offered to pay for my train fare down to London and put me up in a hotel the night before the event because I wouldn’t have been able to get there on the day in time via public transport. On the way down, I was mentally preparing myself to adjust to the idea of staying in a rundown B&B in the middle of nowhere, or a travellers hostel like the one in the film. I couldn’t complain though, after all, charities have a small budget in which every penny counts, right? Along with my keycard to the room, I was handed a receipt of the invoice sent to the charity. They had paid an astonishing £250 for it. I had to double check that there hadn’t been a mistake. Surely this suite couldn’t be all for me, one person, one tiny 5″6 person for one night. It was. I had been totally unaware, up until that moment, that these kinds of excesses weren’t uncommon in the ‘voluntary sector’. In fact, the title ‘voluntary sector’ is a little misleading as it actually employs 901,955 people at a cost of over £14.5 billion a year. The last available data is for 2011,since then, 200,000 more people were employed in the sector so the figure for this year will be significantly more than £14.5bn. According to the Charity Commission website, 6% of charities control nearly 90% of the enormous £62 billion the sector generates. They also employ 90% of the staff mentioned earlier, with many senior staff earning more money than the prime minister. 150 of the biggest charities employ staff on more than £60k a year, with some CEO’s earning more than £300k a year. You may ask: What should it matter to us? If people give money to a charity, surely it’s up to them to decide whether or not it’s going to the intended cause? This is very true, people should check how much of the money they donate is spent, but not all of a charities money comes from fundraising. In fact, 25’000 charities receive more than three quarters of their funding from government and in some cases this can amount to millions of pounds per charity. This state dependence expanded massively through the Blair years, between 1997 and 2005 the combined income of Britain’s charities nearly doubled, from £19.8 billion to £37.9 billion, with the biggest growth coming in grants and contracts from government departments and when contributions from the National Lottery are taken into account, charities received more money from government in 2010 than they did from voluntary donations. Not all of the mega charities are dependent on taxpayer money, some rely entirely on donations such as the Donkey Sanctuary, Cats Protection and the Royal National Lifeboat Institution. Charity shops aren’t always straight forward either. For example, Sue Ryder, operate around 400 retail stores and according to their financial reports, their stores generate £49.3 million. Not bad, eh? It looks astonishing on paper, that a relatively modest chain of charity shops can make so much money from the items people donate, but when you look at how that money it spent, it costs £39.2 million to run the shops. Only £6 million (around 12-13%) goes towards paying towards the nursing care side of the charity. People generally assume when they donate to charity shops that the money from the sale of their goods go towards the charities main charitable expenditure, not lining the pockets of charity shop managers, or going towards buying up land to resell later for a profit when the value increases. It may also surprise you to know that charities are the biggest investors in the stock market after investment bankers. This was highlighted most recently when the Jecda Foundation which is run by Lord Freud’s family, was found to have only spent £37k last year on charitable causes in comparison to the £250k it ploughed into a ‘dollar track fund’ in the US’ . There’s also another recent phenomenon that has emerged over the last few years: Agressive fundraising. This includes things like people being sent unsolicited appeal letters through their door, being hounded by cold callers or being pressured into signing up to a regular donation via direct debit in the street by chuggers. An ex-chugger who spoke to me told me that they were told to target certain types of people, especially the elderly or those who “looked kind”. 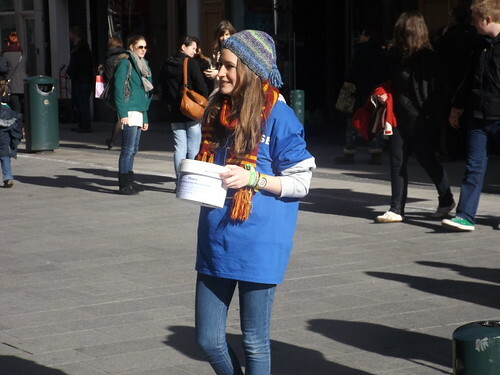 At her induction day, they were told to try and make people feel like they have to donate. This amounted to her and her colleagues trying to guilt people into signing up to donate a regular amount via direct debit who probably weren’t in the best frame of mind to make an informed decision about giving. Even those people who had signed up but decided to cancel their payments to charities, were hounded by them to sign back up to donating regularly. Although our economy is on the road to recovery, we still have a long way to go in reducing the deficit and we have to ask ourselves, is our money being spent in the right way? Should we continue to borrow money to pay charities for their work? If a charity cannot survive on public donations, why should taxpayers foot the bill? If you are interested in a deeper analysis of the figures, Chris Snowden from the Institute of Economic Affairs has published a report entitled ‘Sock Puppets: How the government lobbies itself and why’ which goes into much more detail about some of the things I’ve written about above. If someone calls at the door or phone and you mention exec salary’s the shut up and go. They do not engage as though that’s how they have been trained.